Santa Special preparations well underway! The ever popular ‘Santa Specials’ are being rapidly booked up!Â As you can see the staff are working flat out to have everything ready for our ‘very special guest’. Below the PW lads lend a hand getting ‘Santa’s’ sleigh ready for the specials.Â The MPLR will be running Santa Specials every Sunday leading up to Christmas, with extra runs on Christmas Eve.Â Contact the booking office for tickets.Â Not to be missed. 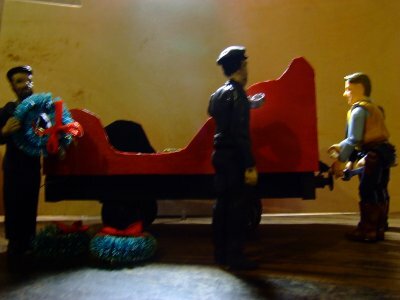 Archie brings the decorations that will be used to make the sleigh even more festive.Â The PW lads seem to be having a bit of bother with one of the couplers.Â We are sure that with Jim’s good advice, they will soon sort it all out. 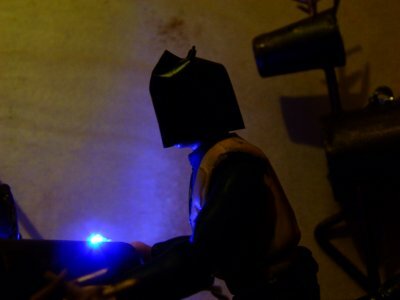 Meanwhile, in another part of the workshop, Terry is hard at work welding up the reindeer that will be used in Santa’s Grotto’.Â Terry is a qualified arc welder and holds all the current certificates. Staff have been working hard preparing the Santa Specials that we will be running over the festive period.Â More details to follow.Â Also, a new, updated, map has now been added.Â Check it out for all the latest changes to the railway.